As I type this, it's 1 am, I have just finished packing and I have to be up to leave for the airport in three hours, yet I'm sitting here blogging. Can I get a dedication award? I counted down every day to get back to the US for various reasons - to see my friends, to move into my new room, to catch up with my roommates, to go shopping, to see a concert and whatever other stupid excuse I could think of. I didn't really appreciate all the time I had at home, in my absolutely beautiful country, with all of my amazing friends, and my family who I love and miss 24/7. So, I'm making a pact: no matter how homesick I get this semester, no matter how badly I want to jump on a plane and fly the several thousand mile distance between home and school, and no matter how much I want to cry, I won't. I'm promising to enjoy every single minute of my semester, because this life is literally amazing.. I'm not counting down until Christmas Break or the next time I see my sister or any of my other friends, because it's wasting my time and my energy. I'm going to enjoy every day, and the time will fly by faster anyway. And then when I look back at those days, I have even more to remember than just waiting around for one particular day. 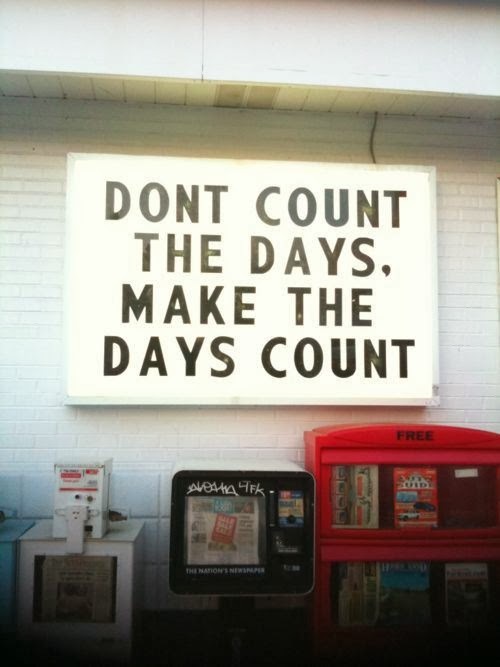 So, here's to making every day, every hour and every minute count.. and to never counting the days. Life is too short anyways.. I know this post makes no sense right now, guys. I apologize! My brain is literally just not functioning anymore. I'll hopefully be back tomorrow, if I can muster enough energy to write a post tonight.